I've just enjoyed a rather hectic and exciting weekend of arty doings for Leeds Light Night which has taken over the city. I have to admit that I knew nothing of Light Night until I was given a flyer at last weekends Alternative Comics Fair and was asked to go along by a friend. There were so many events happening at once that I felt rather flustered as I wanted to see everything RIGHT NOW! Luckily common sense prevailed and we managed to pick some things to go and see. Sadly I forgot to take my camera with me, so I apologise for the lack of photos with this post! Particular favourites for me were the Craft Garden in the old victorian cells underneath the town hall, which had turned the cells into different crafted worlds. My favourite was the autumn/urban room complete with crack fox rooting through an upturned bin, knitted mice and snails and demonic creatures with red glowing eyes. Well worth the 20 minute queue! We also experienced the Caravanatron - a Barbarella / Sleeper themed installation. After a 45 minute queue in the frankly freezing cold each participant was given a silver pill (a Smartie) and indiviually entered the caravan. Inside was a silver room, where you lay on a silver bed/cushion and were strapped in to experience a projection about the stars and a vibrating bed. We also got to see the takeaway poetry van operated by Morely Literature Festival , paper nests in the Art Library, an 'art trail' across the city using flashing buttons as beacons (mine fell off at the Caravanatron), free cocoa on the 18th floor of West Riding House and a knitted interactive keyboard from 'Knit a Bear Face'. Some of the events we fancied were fully booked by the time we got to them, so pre-booking is a must next time! 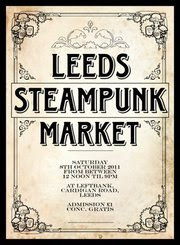 On Saturday it was also the Leeds Steampunk Market in Headingly. This was a tie in to the Semaphore Office which appeared as part of Light Night (although we were unable to find it!). Loads of fantastic stalls full of shiny things, comics, memorabilia, costumes and of course tea and cake. I was horribly underdressed compared to the good gents and ladies of the market, but was complemented on my 'fox fur' scarf several times! I have also been trying to craft in between all of these arty doings, so there will hopefully be some Halloween decorations appearing in the next few days.